"Comedy is tragedy plus time," a character says in Woody Allen's Crimes and Misdemeanors which perfectly illustrates both dramatic subjects. Crimes takes time to get into its rhythm, but the longer it goes on, the better it gets. It has become almost a cliche to hear people complain about Woody's recent ventures into drama (September, Another Woman). They say, "We like his earlier, funny ones." They have missed the boat. Allen is as assured a writer-director of drama as he is of comedy, and this is just one of the many levels in which this film works. Crimes and Misdemeanors tells two loosely connected stories. The dramatic one concerns an ophthalmologist (Martin Landau) who is being blackmailed by his jealous mistress (Anjelica Huston) who wants him to leave his wife (Claire Bloom). The comic one concerns a documentary filmmaker (Allen) who is forced into making a movie about his obnoxious, successful brother-in-law, a TV producer played by Alan Alda. Allen is unhappily married and begins to fall for the documentary's producer (Mia Farrow). The twists of the stories are part of its enjoyment, so I won't delve any further. However, whereas Hannah and Her Sisters took his typical neurotic, God-doubting Jewish New Yorker and added a dash of optimism, Crimes goes the other direction. This is a film of and about the 1980s. It is cynical and has a lot to say on all the topics Allen has specialized in for years — religion, relationships and success. Religion is what binds the two otherwise unrelated stories together. 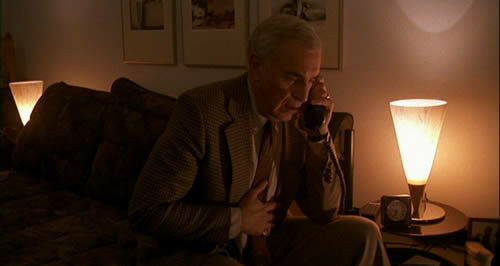 Landau is treating Allen's other brother-in-law, an optimistic rabbi (Sam Waterston) who is slowly going blind. Waterston's character is, in a way, the most important character in the film, in keeping with the eyes motif established early on. Landau and Allen both view the world as harsh and devoid of values while Waterston insists that there is a real moral structure out there involving forgiveness and a higher power. Waterston's blindness helps to show the film's message that in these times, a sin seems to be a sin only if you get caught. Another strand of this philosophical approach is a professor that Woody's character wants to make a documentary about. The professor speaks of religious optimism and how a loving God is beyond man's capacity for reason. He talks about how love is a contradiction and life is painful but we need the pain. His words, and his later off-screen action, help lend the somewhat nihilistic view the film ultimately presents: that morality only exists for those who have it. The film is full of great lines and great performances, something one expects from a Woody Allen film, but it also is the perfect fusion of Allen's filmic styles. There is Landau, discussing his problems with Waterston (in what may or may not be an imagined conversation) where he tells the rabbi that God is a luxury he can't afford. There is a virtual cascade of classic Woody lines such as "The last time I was inside a woman was when I visited the Statue of Liberty." It also contains some perfect casting choices: There's enough of a resemblance to believe that Landau and Jerry Orbach are indeed brothers. There are the stylistic and story elements that stem from Allen's love of Ingmar Bergman. In fact, he even uses Bergman's frequent cinematographer, Sven Nykvist, and Nykvist contributes a golden, almost mildewy look to the proceedings. Technically, this is among Woody's best. His direction has evolved over the years and fully complements his screenplay. Woody's character spends a lot of time taking his niece (Jenny Nichols) to old movies playing in revival houses: musicals, classic gangster flicks, the works. This contributes to the idea that, as much as Woody loves these films, he can't make them in this day and age. If you want happy endings, go to Hollywood. If you want reality, go to New York, especially if Woody Allen is your chauffeur.